Courts and regulators have increasingly seen high-speed internet as a public utility that is as essential to Americans as electricity and water. But many Americans still do not have broadband at home, and some Americans have turned to mobile devices as their primary gateway to the internet, according to Pew Research Center surveys. But whether smartphones are an adequate substitute is open to question. Those who depend on their smartphones to go online encounter constraints with data caps and small screens, and the device is not their “go to” tool for personal learning at home. Instead, those with smartphones but not home broadband rely on a kind of “workaround ecosystem” that is a combination of using their mobile devices along with other resources such as computers and Wi-Fi available at public libraries. A third of American adults do not have high-speed internet at home, according to a 2015 Pew Research Center survey, and slightly more Americans were without broadband at home in 2015 than in 2013. As a result, mobile devices have become an alternative. 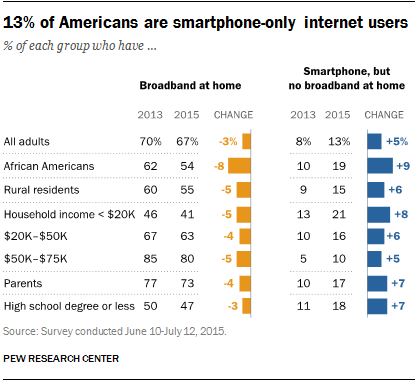 Some 13% of U.S. adults are “smartphone only” internet users – meaning they own a smartphone but do not have a home broadband subscription, according to our data from 2015. In 2013, that share was lower, at 8%. This group is more likely to be younger, lower-income, less educated, or black or Hispanic – the same groups that also have lower rates of home broadband adoption, suggesting that some are forgoing high-speed internet service and depending on their phones instead. In a series of studies, Pew Research Center has investigated smartphone adoption patterns and how people experience the internet using a smartphone. The Center found in “U.S. Smartphone Use in 2015” that 19% of Americans are smartphone-dependent, which includes people who are either smartphone-only or have some sort of access that is beyond just a smartphone, but limited to such an extent that they mainly use their smartphones. Although smartphones help those without home broadband to access the internet, this group frequently encounters a number of constraints with data caps. The Center’s survey, conducted in October 2014, found that smartphone-dependent internet users are more likely to have canceled or suspended their service because of financial constraints (48% vs. 21%) or have reached their plans’ data caps (51% vs. 35%). There are other challenges. 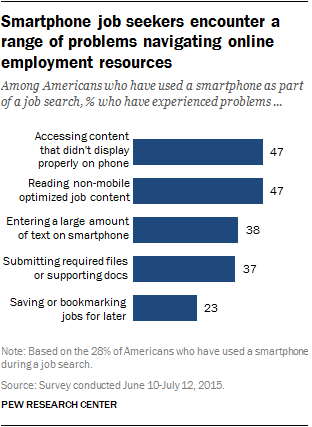 For example, 28% of adults have used a smartphone as part of their employment search, and half of those have filled out a job application using a smartphone. But mobile job seekers often encounter difficulties like accessing and reading content, as well as trouble submitting files and documents. Another perspective on the difference between having home broadband and depending on smartphones comes from looking at how people use technology to pursue lifelong learning. Pew Research Center’s “Lifelong Learning and Technology” report found that 74% of adults engaged in personal learning activities in the prior year, such as attending book club meetings, conferences or conventions, or taking courses. Among the 74% who did one of these learning activities when learning at home, 69% said they used a laptop or desktop computer; 11% used their smartphone; 9% used a tablet computer; and 6% used a combination of these devices. 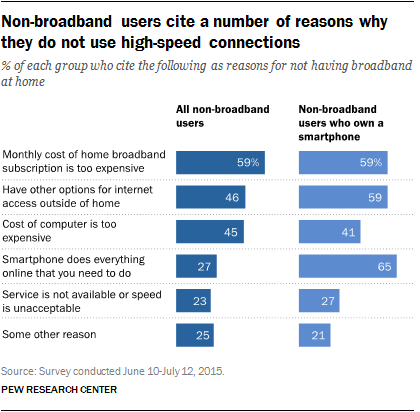 So why are some smartphone users forgoing broadband? Some 65% of the smartphone-only Americans say the smartphone lets them do all they need to online, according to our 2015 survey. But while the smartphone-only clearly see the usefulness of the device, cost plays an important role in the decision not to subscribe to high-speed service at home. The availability of other access options outside the home also comes prominently into play. Public libraries may help fill the online gap among smartphone users who don’t subscribe to home broadband services. For public library users, those with smartphones only are somewhat more likely than those with home broadband, by a 34% to 30% margin, to use a library’s Wi-Fi, computers or internet connections to get online. Similarly, for those who engage in personal learning activities, the smartphone-only are more likely to do this at a high school, college or community college than those with broadband at home (by a 40% to 24% margin). John B. Horrigan is a former senior researcher focusing on the internet and technology at Pew Research Center.